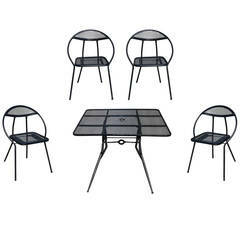 Featuring 7 pieces, this contemporary outdoor collection features a dining table crafted of teak wood and all-weather resistant aluminum framed chairs. 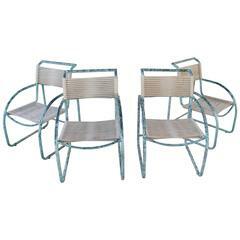 Each chair is wrapped in synthetic rope in a tasteful, artistic open design for more air circulation. Each chair is upholstered in high-resiliency foam cushions with 100% solution-dyed fabric that resists mold, mildew and fading. These chairs are stackable. The dining table is crafted of finely sanded teak. 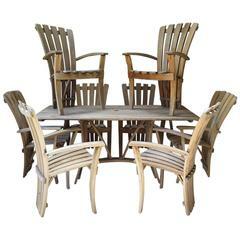 Dimensions: Table: 78.75" L x 39.5" W x 30.25" H Weight 121 lbs Chair: 24" W x 22.5" D x 30.75" H Seat height: 15.75" Weight: 25 lbs.